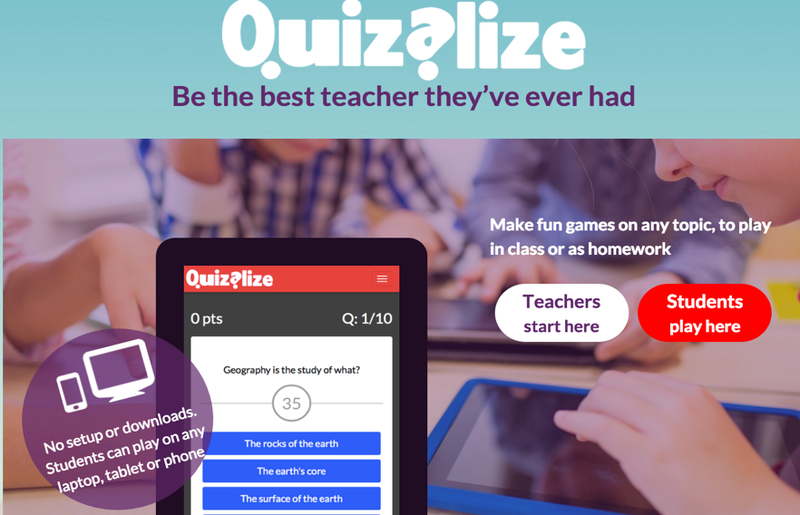 Quizalize is a very good classroom quiz tool. This tool allows teachers to create fun exams or homework assignments. Teachers can see results live and identify students' strengths and weaknesses easily. The process of creating a test is simple and easy. After logging in to your account (registration is required, Quizalize Free for individual teachers), go to your "Tests" tab and click "Create a new test." Follow the instructions and type your data. Once you're finished, click Save to save your test. To set the test for your students, click the Test Setup button and enter the name of the class. A unique code will be created for you to share with students. Students can then go to www.quizal.me and enter the class code and their name to access the test. If this is set to Yes, students will receive sounds on their devices when the test runs. Provide the same questions to all students, but in a different order for each student. Random selection of a smaller set of questions from all questions in a quiz (select number). If this setting is not displayed on any timer, it will not appear to students. Show students the right answer when the student gets the wrong answer. Show students the correct answers and fink report. paying off Frequently Asked Questions page To learn more about Quizalize.